These were big in the 50's and 60's and my Mom made them often. They were so good and I loved it when we had them for dinner. 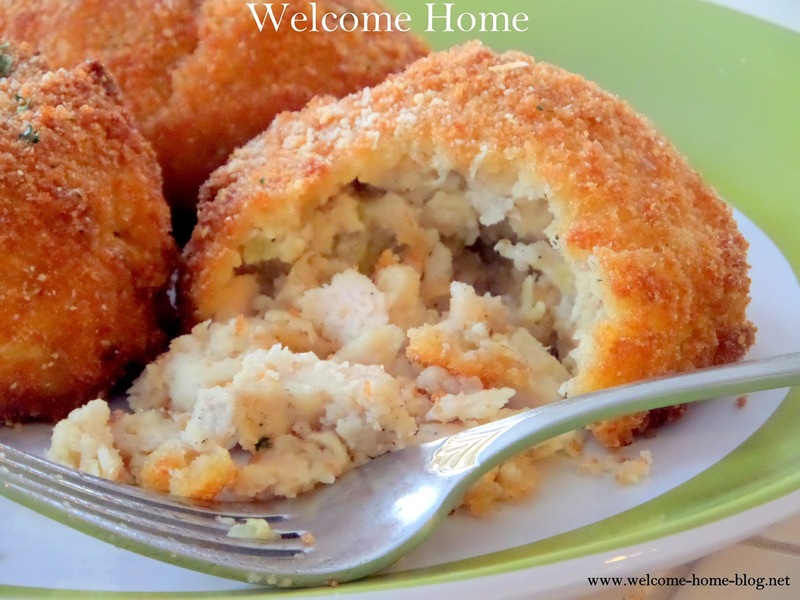 Crispy on the outside and filled with a creamy, tender chicken breast filling. I've been making them ever since and I haven't changed a thing. They are still as good as I remember them. Did your Mom make these when you were growing up? Place chicken in bowl with minced onion and add a generous amount of salt and pepper to taste. Stir and set aside. Place butter in a large non-stick skillet and melt over medium-high heat, stirring frequently. Whisk 1/4 cup flour into melted butter and cook 1 minute. Add half and half or cream to skillet, whisking constantly, to blend in the butter/flour mixture. Bring mixture to a boil, stirring constantly so that it doesn't burn on the bottom. Continue to stir until sauce has thickened. Remove skillet from heat and stir in diced chicken and minced onion and celery and mix until well combined. Place mixture in a covered container and refrigerate 4-6 hours, or overnight. Place crackers in a zip-lock bag and seal (pressing out all air). Using flat side of a meat mallet, crush crackers finely and pour in bowl. Add flour, poultry seasoning, and salt and pepper to taste and mix well. Set bowl aside. In a small bowl, whisk 2 tablespoons water with egg. Set aside. Now form your croquettes. Using your hands take about two tablespoons of the chilled chicken mixture and roll between hand, forming 8-10 equal sized croquettes. Set aside. You can make them any shape you want. I usually do round because it's just easier. Dip each croquette into egg wash one at a time and then roll in the cracker crumbs to coat very well. Once you have coated them the first time, dip them again in the egg wash and coat them a second time. Set them aside. In a large non-stick skillet heat 2 tablespoons of olive oil over medium-high heat. 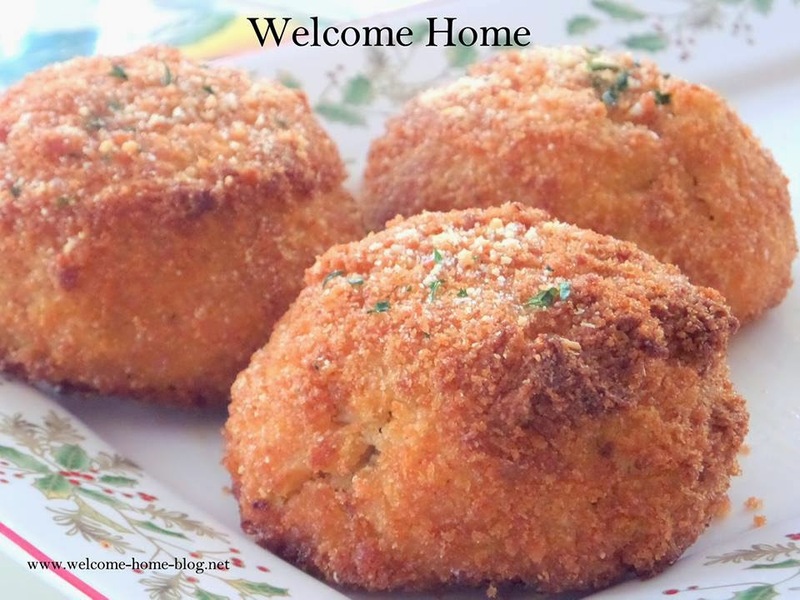 Place croquettes in hot skillet and brown on all sides, carefully turning with tongs. Cook in batches if necessary. Do not crowd them or they will not brown and will be difficult to turn. Preheat oven to 350 degrees and line a baking sheet with parchment paper or spray with non-stick spray. Bake uncovered for about 30 minutes until heated through. Sprinkle on a little Parmesan and parsley for garnish...or serve with creamy chicken gravy...see recipe below. Combine the soup, sour cream and butter in a medium saucepan and whisk until all are combined. Continue to stir the sauce over medium high heat until sauce is hot and bubbly. 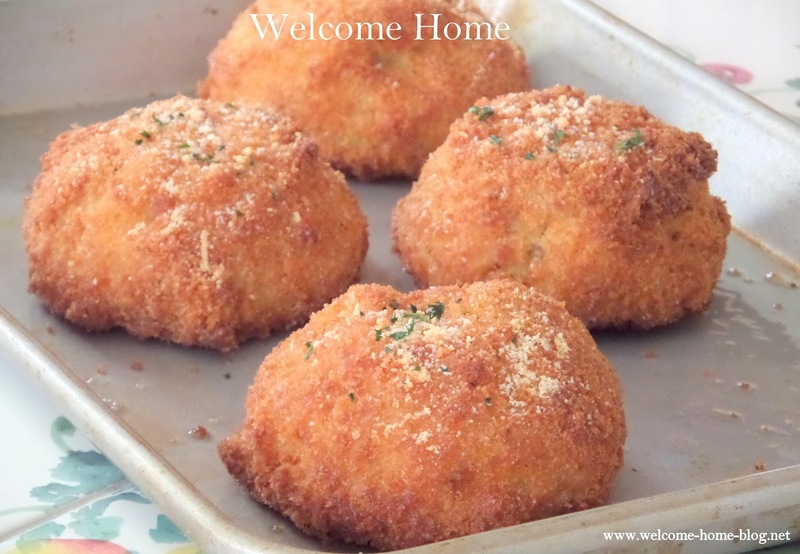 Serve over chicken croquettes. Enjoy!